Sharks Forward Jeff Friesen and Defensman Marcus Ragnarsson team up for a punishing hit on the opposition along the boards. Checking is what makes hockey a "collision sport" as opposed to "contact sports" such as basketball. The game of hockey is rivaled only by football as being the most physical professional team sport. While the object certainly isn't to "tackle" the opposing player, physical checks slow down, take out, or otherwise affect the opposition's ability to play the game. The players we talked to had different ideas about what makes an effective check and we couldn't help but try to find out just how much energy is released in a check. 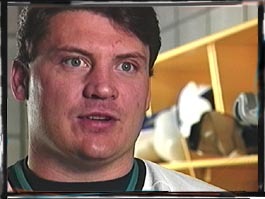 In this section, there is a RealAudio and video clip from Sharks Forward Todd Ewen. Checking can be defined as using physical force (without breaking the rules) to either gain possession of the puck or to disrupt the opposition's play. When we interviewed Sharks players about checking we were somewhat surprised by the variety of the responses. Each player seemed to have a different take on what makes a check an effective one. All of the players felt that body positioning was important. Sharks Defenseman Doug Bodger stressed it and the relationship between where he and the opposing player were on the ice. Apparently, there is a great deal of danger in throwing a check--it's not that you can get hurt (although that is always possible) but rather that you can get burned by putting yourself out of position. 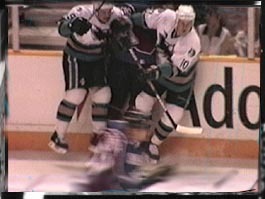 Sharks Forward Todd Ewen's concern was in keeping the stick and his hands down. The object of a check is to take another player out of the play or make him cough up the puck, but you don't want your team to wind up a player short because you're in the penalty box. Sharks Forward Todd Ewen talks about executing a proper check. When you think about checking, you think about crushing hits against the board or open ice hits that send players flying through the air. While those types of hits are certainly checks, there are other more subtle types of checks. Poke-checks or stick-checks are when a player uses his stick to "poke" the puck away from another player. Sometimes goalies will use this technique to stop players who are trying to come around the back side of the goal. Back-checking is when a player (usually an offensive one) comes in behind the opposing player to get into the play. This situation usually occurs after a play is broken up in the opposition's end, a breakaway situation develops, and the players rush to their own end to get back into the play. Click the "forward" button below to continue.